Suu Kyi for democracy or Buddhist fascism? Opinion by Dr. Muang Zarni: Truths and totalitarianism are irreconcilable. They have never co-existed, they do not coexist, and they never will. Truths and totalitarianism are irreconcilable. They have never co-existed, they do not coexist, and they never will. Whatever the exterior – fascist, corporatocracy (government of, for and by corporations), military, communist, or theocratic – the regimes of un-truths share a common hallmark, namely, their marked disdain for empirical facts that undermine their legitimacy. Through manufactured falsehoods, they all try relentlessly to establish and maintain a monopoly grip on power and control the population, both bodies and minds. The arrest of two Burmese Reuters journalists who were sniffing the military’s dark “top secrets” in Rakhine is just one evidential incident in a long series of frontal assaults on truths which Myanmar’s NLD-military hybrid regime seeks to conceal. Myanmar government uses anachronistic colonial-era ‘security and anti-sedition’ laws to put in interrogation cells journalists or activists who attempt to uncover and expose them at great personal risk, while it labels some of us outside Myanmar as ‘national traitors’ and ‘enemies of the state’. As a recipient of such high national honour, I speak from my own experience. This is not news, however. Astute students of politics know very well the hand-in-glove nature of falsehoods (official propaganda) and political repression, in all senses of the word. But what is new, and deeply troubling, is the “Free World” of the West (that is, USA, Canada, EU, Japan and Australia, as well as certain UN agencies) are resorting to exactly the same type of totalitarian methodology insofar as their justifications offered in defence of their business-as-usual Myanmar policies are concerned. That is, London, Washington, Brussels and other western regimes are crafting, promoting and defending a single lie, just as they put out ‘statements of grave concerns’ directed at their increasingly repressive Myanmar business partner. The country is in a fragile democratic transition under the leadership of Aung San Suu Kyi, who represents ‘the best hope’ for the people. Accordingly, the West’s Myanmar policy delusion demands that we suspend our common sense and swallow its self-serving discourse of ‘balancing’ the need to address the country’s genocide of Rohingyas and stand with the Great Democratizer, that is, Aung San Suu Kyi. These prevailing Myanmar policy discourses are self-serving at best and sinister at worst. As a Burmese activist who has worked on Myanmar political and policy affairs for nearly 30 years, having lived in Washington and London, I smell a rat. These discourses under their liberal veneer are self-serving because they enable Western commercial and strategic interests, however defined and whatever they are, to stay put in Myanmar despite the genocide. And they are sinister because western policy-makers know that the road to democracy and human rights has never run through any totalitarian ideology or system. Nazi Germany, fascist Japan, communist dictatorships of former USSR and the now deceased Eastern Bloc spring to mind. And my country of birth today, both the ruling hybrid regime and the society at large, is progressively moving not towards any form of pro-human rights democracy, but towards what I call Buddhist Fascism. In this sordid political climate in Myanmar, the formerly pro-human rights public, peaceful Buddhist Order and pro-human rights dissidents, from Aung San Suu Kyi and former student leaders of the Great Uprising of 8.8.88, have closed ranks with their former military jailors and torturers. Their new-found mission is nothing short of building a Myanmar majoritarian ethnocracy where Buddhism is systematically misused as the state’s political ideology. The Commander-in-Chief Senior General Min Aung Hlaing has repeatedly declared ‘defence of Buddhism’ as an additional duty of the armed forces, in addition to serving as the self-style institutional shepherd of what the generals call ‘Discipline Flourishing Democracy’. His former titular boss, ex-general and President Thein Sein, enacted the Four Race and Faith Defence Laws, persecutorial and discriminatory towards millions of non-Buddhist citizens. In addition, Myanmar military has accomplished its long-standing, if unwritten, objective of cleansing the armed forces of any officer who is not Buddhist. While the country’s most powerful institution is well-known for its Islamophobia, what is less known is that Christianity is widely mocked, being called “Virus C”, sufficient ground for discharging military officers from strategic positions. To the dismay of many of its Muslim supporters, Aung San Suu Kyi’s NLD party, with the parliamentary majority has followed suit: it has not a single Muslim representative, thanks to the autocratic Suu Kyi’s single-minded strategy of pandering to the racist Buddhist majority. Consequently, for the first time in the country’s 1,000-years of recorded history, Myanmar now has Muslim-free armed forces, a Muslim-free parliament and a Muslim-free executive branch. (The judiciary doesn’t count as its decisions are dictated by those in the executive branch and ultimately by the military). Religion isn’t the only issue that drives both the NLD and the military’s policies and political moves. The Burmese majoritarian ethnic identity is inseparable from this institutionalisation of Buddhism as the country’s ruling political ethos, displacing, in effect, any secularist values such as respect for non-Buddhist and non-Burmese ethnic and religious minorities, multiculturalist pluralism, fundamental human rights, civil liberties and intellectual and press freedoms. In response to a strong criticism by the UN Special Rapporteur on human rights situation in Myanmar Professor Yangee Lee directed at the country’s state actors, the NLD-controlled national parliament passed unanimously the NLD’s motion, specifically designed to condemn Ms Lee and her mission to investigate and highlight human rights violations. Only in a totalitarian system of governance is such unanimity of views and votes conceivable and possible. Indeed, Myanmar today is, in essence, more akin to Germany in the 1930’s where a single ethnic community, namely German Jews, were singled out and made scapegoats for all the fears and ills that the majoritarian public was reeling from. It defies intelligence to paint, as western governments and regional blocs such as EU are doing now with a collective straight face, Myanmar’s emerging populist politics with its fascist characteristics as a ‘fragile democratic transition’. This is against the backdrop of Rohingyas being singled out as ‘illegal Bengali migrants’, for extermination the way European Jewry were in the Nazi-occupied Europe. 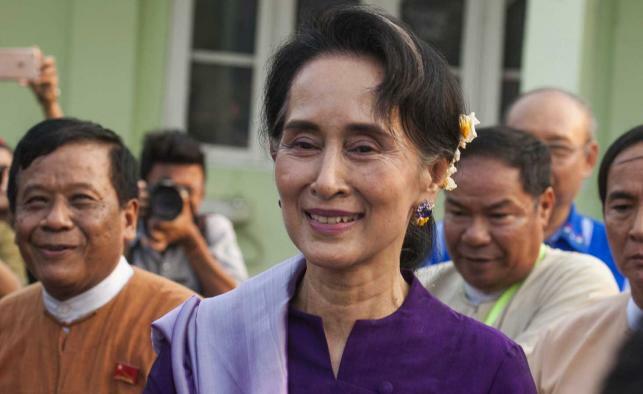 What of Myanmar’s “best hope”, namely Aung San Suu Kyi, who had until recently been viewed worldwide as ‘Asia’s Mandela’ or an iconic leader in the mould of Gandhi and Martin Luther King Jr.? Suu Kyi’s abysmal record on human rights promotion since her release from house arrest in November 2010 speaks volumes. Dismissing any association of human rights with her leadership – “I am not a human rights defender, but have always been leader of the political opposition” – the NLD leader has chosen not to stand up for the displaced Burmese farmers, the non-Bama ethnic minorities, for instance, Christian Kachins in the war zones of Eastern Myanmar, student dissidents who demanded democratic educational reforms, and even her own rank and file members who attempted to challenge the military-backed racial and religious discrimination. And worse still, Suu Kyi has on more than one public occasion, expressed her ever-lasting ‘affection’ – which she qualifies as ‘genuine’ – for what she calls ‘my father’s army’, even when her former captors in general’s uniform have long been accused of commissioning all crimes in the international law book including war crimes, crimes against humanity and genocide. Five years ago the world welcomed and held up the ‘Burmese Spring’ as a model democratic transition. Now the only transition that my old society is undergoing is a transition to Buddhist fascism. In today’s Myanmar former dissidents speak of ‘national security’ against Muslims – and particularly against vulnerable Rohingyas – and most local journalists use their hard-earned press freedom to promote the military’s brand of hatred. It is well past time that the Western governments and international institutions stop peddling their twin delusions about my country’s ‘fragile democratic transition’ and its Nobel ‘woman of destiny’.